Convert medical images between different formats. 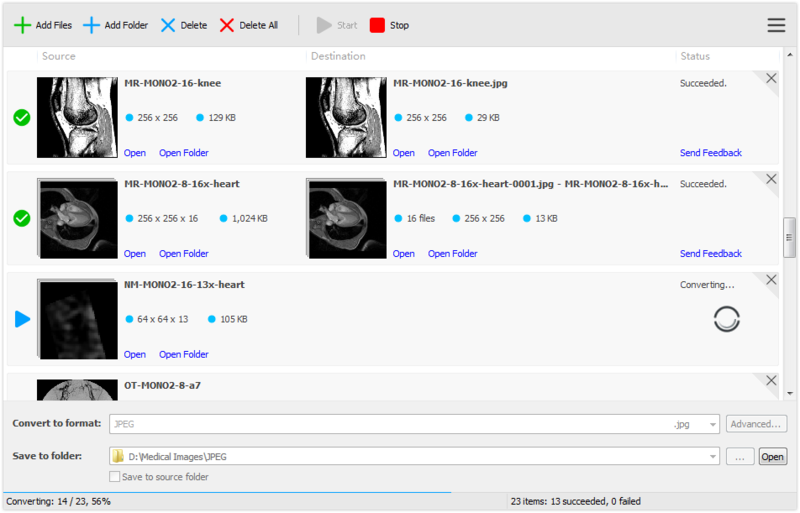 Medical Image Converter is a simple and easy-to-use Windows application for converting medical image files between different image formats. It is a WYSIWYG (What You See Is What You Get) converter that makes things easier. Medical Image Converter can convert medical image files to common image format, for example, convert DICOM images to JPEG format. This is very useful if you don't have a DICOM viewer and want to view or process DICOM images on your computer, just convert them to JPEG or BMP format. Medical Image Converter can also convert common image files to medical image format, for example, convert JPEG images to DICOM format. This function is useful if you want to process and store common images on your medical devices, just convert them to DICOM format. Medical Image Converter can split multi-frame DICOM image file into single-frame image files. Support medical image formats: DICOM, NIfTI, NRRD, MRC, MetaImage, etc. Support DICOM image compressions: JPEG, JPEG-2000, JPEG-LS, RLE. Support common image formats: JPEG, PNG, TIFF, BMP, etc. Medical Image Converter includes a command-line program - mic.exe. This program is very useful for professional users to write scripts for automatic image processing. Medical Image Converter includes a Windows Explorer extension. This extension helps you convert image files with just one click.